After a short flight from Bangkok, I arrive in Vietnam late one Monday evening. A blur of customs, on-arrival visa applications, and airport taxis later, I drop my bag off at the Phoenix Hotel in the Old Quarter, just west of Hoan Kiem Lake. Famished, I decide to step outside and find dinner. The night is cool, a welcome change from the balmy, sweat-soaked evenings of Bangkok. My partner and I walk about half a block before we spot a few low lying blue plastic tables with locals hunched on comically small red stools. Bingo. I’m reminded in this moment of the time I was in Mexico City solo traveling, hunting for authentic tacos in a sea of tourist-facing chain restaurants. Unwanting of the Westernized version of a taco. No, I wanted the real deal and eventually found it–of all places–a quick walk from the popular Zócalo Square. The no-name, hole-in-the-wall taqueria was nothing more than a sidewalk facing window where construction workers stood huddled around soft shell tacos. With dust-covered hands and hard hats, I followed their lead and happily inhaled my first true Mexican taco with shredded chicken, cilantro and lime on a fresh tortilla. In Hanoi, I spot a handful of locals slurping up bowls of broth and noodles in front of a nameless restaurant. There is no need to walk further, I know this will do. My partner and I sit down to cursory glances and blatant stares from locals wondering where we hail from. There is no menu, which is always a good sign here. The food arrives quickly with vermicelli noodles, mint and shredded chicken floating on a light broth. This is Vietnam. I have watched and read about this very sidewalk, religious eating experience on numerous occasions. Yes, the food is famously fresh and simple, but it’s the context of eating on Vietnam’s streets that make the meal. The constant whir of motorbikes, the lilt of a Vietnamese accent, the smells of something delicious bubbling in a cauldron-like vat nearby. During my stay in Hanoi, I record every single meal I have. I want to remember it all in exact, vivid detail. I don’t want to forget the crunch of my first Bahn mi or the taste of my first Cà Phê Trứng. In between orgasmic bites of local Vietnamese food, I pull out my notebook and begin to scrawl down notes of the taste, restaurant, and my surroundings in this culinary destination. A dark alley gives way to an oasis of a cafe where greenery greets guests. A fat, orange cat purrs by my feet. Vietnamese Garfield incarnate. I climb the steps to a rooftop view of Hoan Kiem Lake. There’s no food here—as far as I can tell—just coffee. Sweet, sugary, syrupy famous Vietnamese coffee. I order the egg coffee (Cà Phê Trứng). The coffee quickly becomes a full-fledged obsession of mine. Cà Phê Trứng is strong Vietnamese drip coffee topped with a homemade egg creme that combines two raw egg yolks, vanilla and condensed milk whipped into a thick, fluffy layer. The drink is more of a dessert, it fills your mouth with a top layer that has the taste of tiramisu and the consistency of melted marshmallows. I’m sitting in a sweet, yellow room that is open to the street. Bahn Mi 25—regarded as one of the best in Hanoi—sells nothing but Bahn mi sandwiches. I order the egg and vegetable Bahn Mi, which comes on a crisp baguette with shredded carrots, cilantro a pickle, fluffy scrambled egg, and sauce. The sandwich is, well, a revelation. Simple ingredients that somehow combine to create complex flavors. Cost: 20,000 dong (88 cents). Barack Obama and Anthony Bourdain once ate at this hole-in-the-wall restaurant. I typically avoid these sort of “come eat where this celebrity ate” type places, but in this case, I make an exception. 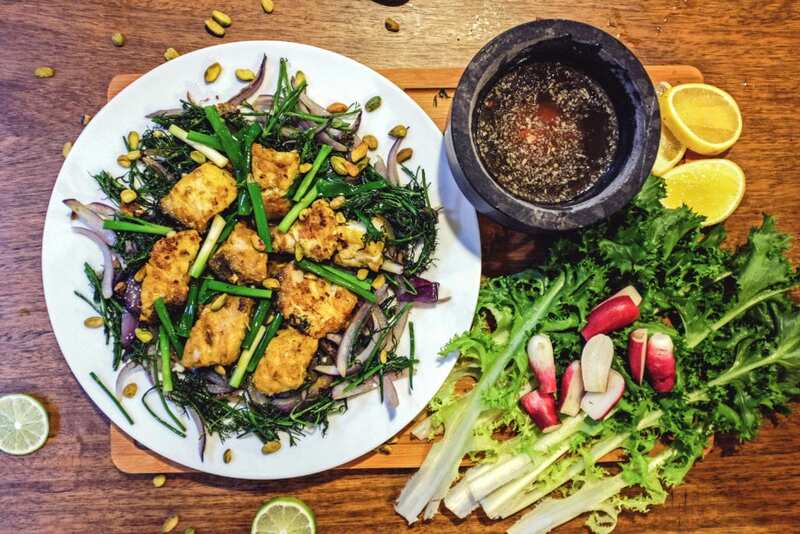 Bun cha is a classic Hanoian dish and this restaurant is hardly a place befitting a president, yet Obama sat right here slurping up noodles and washing it down with Vietnamese beer. I order the “Obama Combo” and have the same Bun Cha he did. A sweet, bitter broth of roasted pork with noodles, mint, and sprigs of cilantro. As I slurp the Bun Cha, I can’t help but think how much I miss our former president and the intrepid traveler that was Anthony Bourdain. Still in the French Quarter, I stop at a coffee shop that looks more like a greenhouse than an eatery. In a moment, I am transported from the busy streets of Vietnam to a hipster bar in Williamsburg, Brooklyn. That’s the vibe of Ohi Tree. Not sure if it’s a good or bad thing. There is a certain welcome familiarity to the coffee shop, but the experience here is hardly anything more than a chance to sip tea and charge our phones. Nighttime in Hanoi and my partner and I are sitting at Bai Hoi junction on the corner of Ta Hien Street and Luong Ngoc Quyen, in the Old Quarter. At night, this intersection becomes a sea of plastic furniture, slow-moving motorbikes, and free-flowing beer. People are sitting on stools everywhere, sipping beer, munching on peanuts, throwing discarded shells onto the sidewalk. We are all simply watching each other and our surroundings. Both within and without, each of us both the entertainment and the entertained. 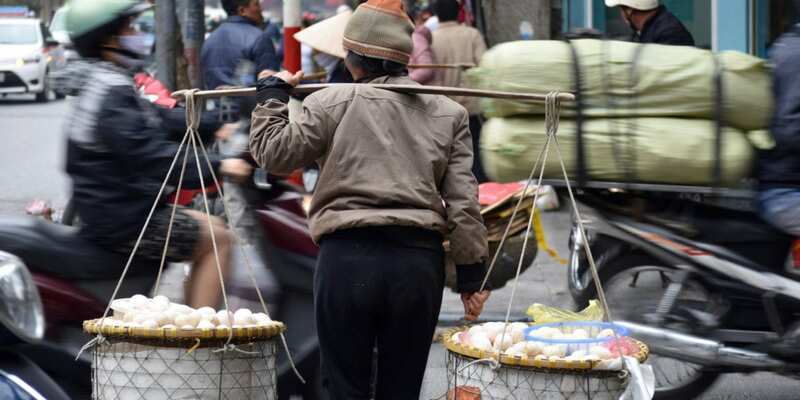 Morning in Hanoi and my egg coffee craving is kicked into full gear. We head to Giang Cafe to try their Cà Phê Trứng. Supposedly they make the best egg coffee in Hanoi. Supposedly the egg coffee even originated here when one day the owner replaced milk with eggs to make his coffee. We arrive at Giang and take a set of stairs up to a room with dollhouse sized tables and framed paintings. The egg coffee arrives floating in a bowl of hot water – a trick I later learn to both keep the coffee hot and help cook the egg creme. It’s good but my first love is Cafe Pho Co.
It’s my partner, Jeff, who ultimately leads us to this find. Always the fish lover, he finds a gaudy, tourist-facing restaurant complete with loud pop music and obscene Vietnam decor that serves grilled fish. The next time he suggests we get grilled fish, I am less than eager to sit through another outdated Britney Spears song and a laser light show over dinner. I decide to see where else we can find the dish we now know is named Chả Cá. We are led to a restaurant in the Old Quarter, Chả Cá Thăng Long on 21 Durong Thahn Street, that is a far cry from the horrendous tourist attraction we previously ate at. The restaurant is full of Vietnamese families huddled over round tables, cooking their turmeric-braised fish over green onions. The fish is cooked at the table and then served with red chiles, noodles, mint, cilantro, peanuts and fish sauce all served in little bowls on the table to combine as you please. I will not leave Vietnam without having Pho and so I head over to 10 Ly Quoc Su on the corner of Hang Trong Street. It’s a quick joint where you come in, are handed a bowl of steaming pho, share a communal plate of chiles, limes, and sauces and then are ushered out once finished. 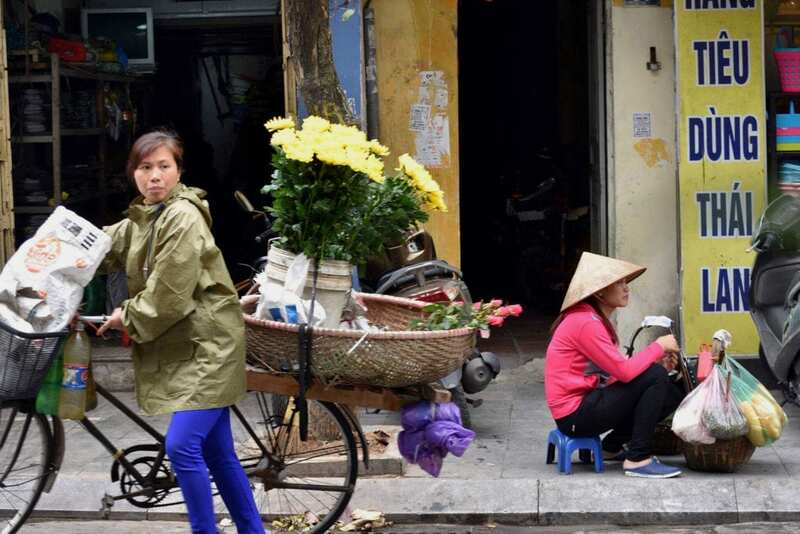 Meals in Hanoi are quick and to the point, there’s no romancing your plate in this city. I unashamedly slurp up the Pho, pay the bill and stroll out the door. Thus concludes my culinary tour of Hanoi.